Apartment with 2 bedrooms for 4 people. Walking distance to shops, restaurants. The apartment Apê Regala is located in the historic center of Mindelo. Shops, restaurants and bars are on walking distance. The apartment is on the top (4th) floor of small apartment complex. There is a lift in the building. In the livingroom there is a dining table for four people, a sofa and an armchair. Sliding doors give access from the living room to the balcony. Internet (wifi) is available in the apartment. On the ground floor there is a bakery, opened every day from early in the morning till late at night. Bread is freshly baked throughout the day. They also sell spreads (ham, cheese, jam) cake, patties, water, cold drinks, ice creams etc. You can also have a seat to drink some coffee. Visit our website for more information about the apartment. The bathroom has a walk-in shower. There is hot water with good pressure. The apartment is excellent – modern, clean and nicely furnished. It is on the 4th floor and faces south so there’s plenty of light and good views across the town to the hills. It can get hot in the sun but the air conditioning works well. Good location – quite central but no noise problems. Equipped to a high standard with everything you need and lots of extra touches to make you comfortable. It is homely but doesn’t have the owner’s personal effects so you don’t feel you are intruding in somebody’s home – for me that’s perfect. The internet is free, unlimited and fast which is unusual in Cape Verde, where slow and expensive is the norm. I would recommend this apartment to anybody looking for a comfortable base in Mindelo. Mindelo is a pleasant town with some old colonial-style buildings and a very pretty natural harbour. It is not really developed for tourism – it is the real Cape Verde and a good choice if that’s what you want. A lot of the people working in tourism on Sal are from here. The town beach is quite small and lacking facilities but you can swim in clear water and it is uplifting just to sit there late afternoon watching the sun set over the bay and the volcanic hills beyond. Schönes Apartment mit schöner Ausicht über Mindelo. Schöne Wohnung, leider etwas wenig Geschirr zum Kochen.Es war trotzdem das beste Apartment das ich in Kap Verde gemietet habe. Der Vermieter ist sehr freundlich und Antwortet sehr rasch.Ich würde das Apartment wieder mieten. Die Wohnung ist sehr zentral in Mindelo gelegen, man kann wunderbar in ein paar Minuten ins Zentrum laufen. Die Wohnung ist auch sehr gut ausgestattet und geräumig, die Bäder sind modern. Momentan ist neben der Wohnung eine Baustelle, wodurch es morgens etwas lauter sein kann. Alles in allem super, auch der Kontakt zu den Vermietern! Wir haben uns in dem Apartment sehr wohl gefühlt. Tolle Ausstattung, alles was man braucht, sogar Strandbadetücher und eine Waschmaschine, was sehr hilfreich war wenn man länger unterwegs ist. Die Eigentümer waren sehr gastfreundlich (im Kühlschrank waren schon ein paar Getränke, Kaffee für die Kaffeemaschine war auch schon da) und hilfsbereit. Wir haben sogar kostenlos ein lokales Handy erhalten (haben wir nicht gebraucht, aber für den Notfall super). Im Haus befindet sich im Erdgeschoss eine Bäckerei, sehr praktisch. The apartment is located in the historic center of Mindelo on the square Praça Dr. Regala. This square is lively during the day and pleasantly quiet at night. Shops, restaurant and bars are nearby. 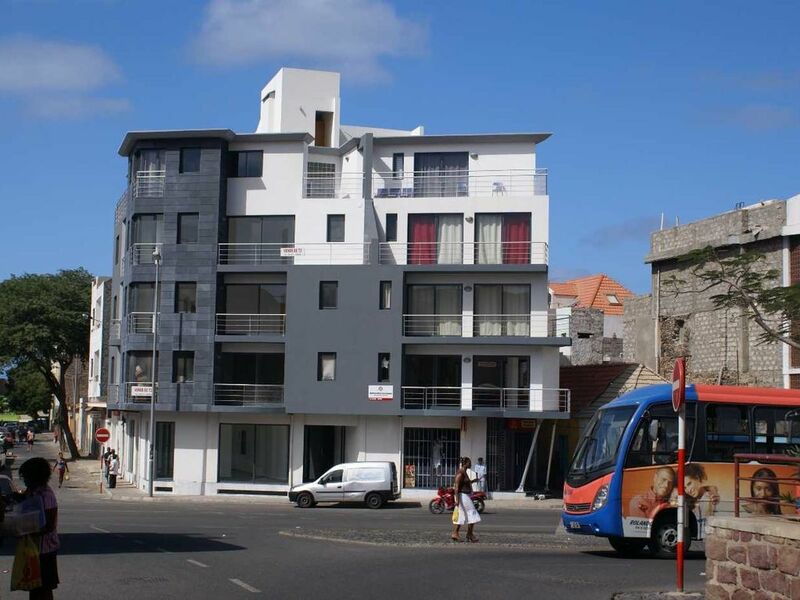 The square in front of the apartment is also the central node for the bus network on São Vicente. A taxi stand is around the corner.